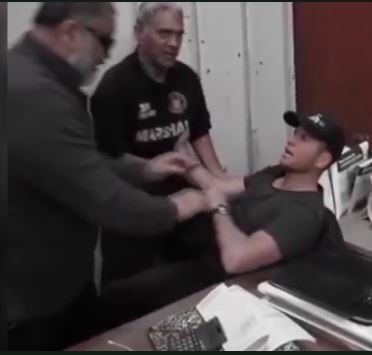 John Wanoa (self proclaimed hereditary King of the Maori) was arrested October 1 after footage was released by him on his YouTube Channel showing the illegal ‘occupation’, assault and forcible ‘eviction’ of workers from a city office in the Auckland area. 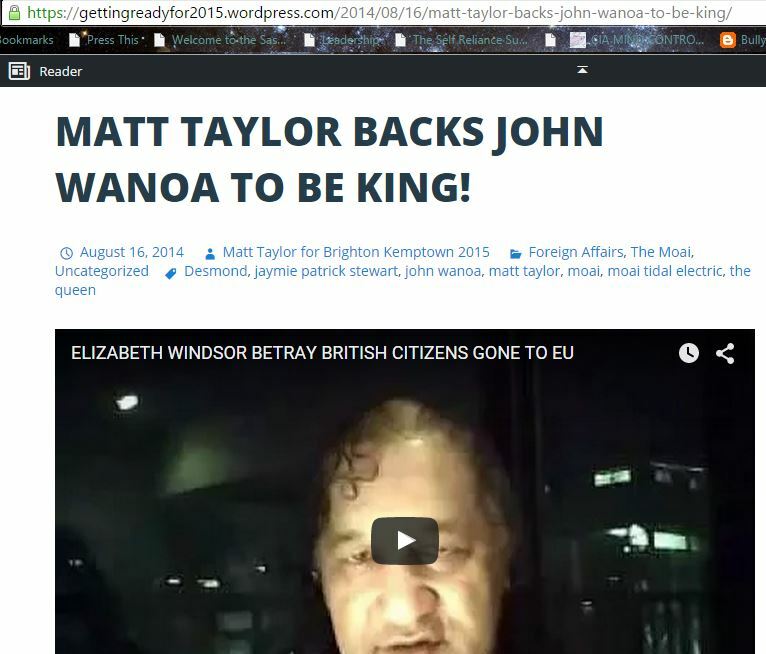 Wanoa, who brags he has posted over 700 video’s to his channel also claims to be the descendant of King William IV, and maintains he has a legal claim to the throne now occupied by Queen Elizabeth II. 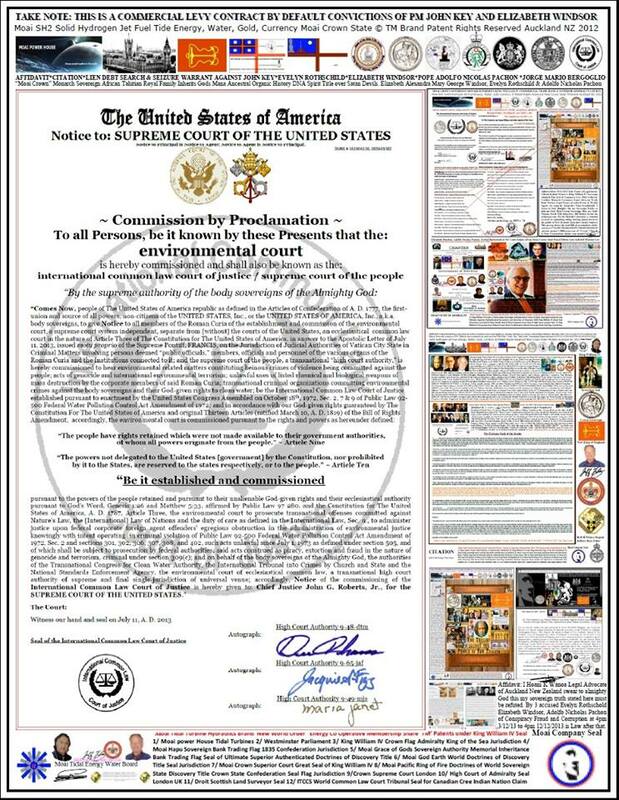 Wanoa’s endorsement and participation with the ITCCS goes as far as using the ITCCS International Common Law Court of Justice seal on several documents used to verify this fact. Wanoa’s nephew, Desmond Wanoa, has posted similar video’s online promising death and dismemberment to members of the British Royal Family along with both Pope Benedict and Pope Francis and New Zealands Prime Minister should they refuse to allow themselves to be arrested by Wanoa and his supporters. 1. Another eyewitness has come forward linking European royalty to ritual killings and human “hunting parties” in Belgium and England as recently as 2008. This witness is willing to go public and their video interview will be available soon. 2. 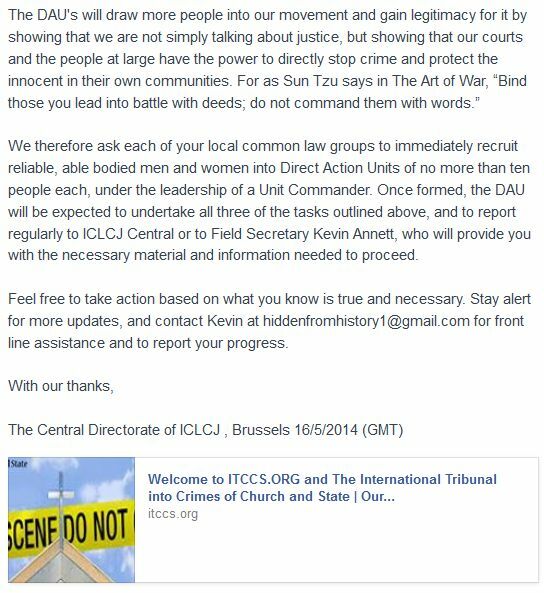 Local organizing funds are now available through the Brussels Tribunal(ITCCS) for any common law group that applies. Write to itccscentral@gmail.com . 3. Our volunteers now number over 450 in 13 countries. Fifty one local chartered common law groups now operate. 4. Not coincidentally, new sabotage has reared its ugliness in response to our breakthroughs. The New Zealand common law face book site is now in the hands of a disruptor named Rachael Kavanagh, who has broken publicly from our work and is making direct threats of physical violence against me as well as spreading the usual smears and lies about me. Rachael is also threatening to work with the notorious “Mel Ve” in Holland who is actively undermining our work at the behest of the Catholic bishop of Utrecht who is linked to ritual child killing. 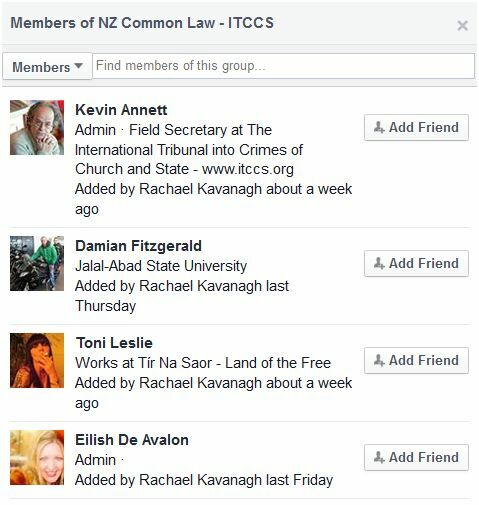 Please know then that the New Zealand common law facebook site does not reflect the work of either myself, ITCCS or the common law movement connected with us. We urge any of our NZ contacts to work directly with us and avoid association with Rachael Kavanagh and those behind her. 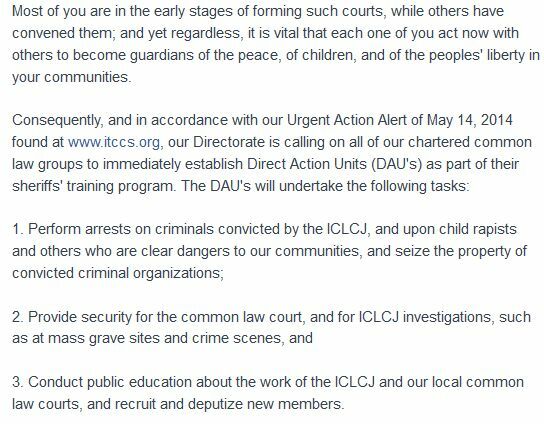 This is the most recent sabotage of one of our more effective groups, after a similar take-down-from-within of our Calgary, Canada common law group. This experience should serve as a lesson for all of us on how the other side works to destroy our effectiveness: by planting operatives early on in our groups who win confidence and then sabotage through misinformation, lies and divide and conquer methods. Armed with this knowledge, do not feed the problem by counter attacking these operatives once they are exposed. We find they fade away when they are ignored. We stand on the truth, the evidence, and our solid committment to saving the children and stopping the criminals. That is our power, the power of the light, Let nothing and nobody divert you from that focus. Here is a picture of the Queen of England Corporate “CROWN” Thugs we called THIEVES in front of their FACES and you can see our own MAORI Faces in there who caused these CRIMES wh caught doing the FRAUD and so you had to CATCH THEM Committing the FRAUD! You can see in the CHAIN of Events how our own NATIVES converted themselves into THIEVES for the “CROWN” Corporation Banker EVELYN ROTHSCHILD who MOAI CROWN will HANG with the QUEEN and the POPE for MURDER GENOCIDE and THEFT of NATIVE LANDS and these MAORI can HANG TOO for just about STEALING our LAND and WHAKAPAPA Ancestral Inheritance, using a TREATY OF WAITANGI Document to SCREW the PUBLIC of New Zealand. NOW they get to see MOAI and the Maori HAPU CONFEDERATION use our KING WILLIAM IV “ADMIRALTY LAW JURISDICTION SOVEREIGN INTERNATIONAL WATERS TREATY CONVENTION FLAG to Boot them OVER the SANDBAR of our FORESHORES with their BAR ASSOCIATION COURTS set AFLOAT on the SEAS of No Protection for them on their way back to ENGLAND! thats it the PIRATES in SOMALIA can EAT THEM Cook them and SINK their BOAT! The Queen has NO ADMIRALTY LAW of the SEAS, only the KING has this as KING WILLIAM III Created that ADMIRALTY LAW and COMMERCIAL TRADING LAW that the MAORI CONFEDERATION FLAG RULES the TRADE over the SEAS FREE PASSAGE anywhere in the WORLD belongs to the HAPU and their TREATY PARTNER The “Government of ENGLAND” Is nothing to do with the “CROWN” Corporation who USURPS our FLAG MANA JURISDICTION we TAKE OFF them NOW! HERE ARE the 10 THUG PIRATES of New Zealand I will be PURSUING this week with the CONFEDERATION MAORI GOVERNMENT PRIME MINISTER Sue Nikora and her TOP Constitutional Lawyer Barrister Charl Hirshfeld PULLS the STRINGS of the “CROWN” to pieces. He and the Confederation successfully STOPPED the “CROWN” Dead in its TRACKS! John Wanoa shared Sovereign Ma Original‘s photo. This man is one of the 12 Convicted criminals on the 61 Cook Street Property Land Transaction in Auckland City that is currently under licensed Private Investigation.. As the Attorney General Chris Finlayson signed off a FRAUD “Crown” LAND SALE and PURCHASE TRANSACTION knowing it to be FRAUDULENT. So now he gets his share of that LAND CLAIM BILL of NZD $5 Billion spread among all of them. Including JOHN and DAVID BAYLEY Real ESTATE facing BANKRUPTCY by MOAI CROWN STATE. MARK HORNABROOK and ANDREW MC’DONALD LAWYERS for LEGALIZING IT. The NZ LAND REGISTER GENERAL ROBERT MUIR for REGISTERING IT on the NZ LINZ TRANSFER TITLE. The NZ LAND SURVEYOR GENERAL ROBERT ANDREL for FORGING the old 1865 SUTHERLAND LAND SURVEYORS SIGNATURE to LEGALESE the REDUNDANT “CROWN” TITLES back into a LIVE FREEHOLD TITLE. In order to DISCHARGE the 11 INVESTORS NZD $300 MILLION INVESTMENTS in this PROPERTY so that the FRAUD MASTERMIND DOUGLAS RIKARD BELL COULD SELL IT at a BIG PROFIT! IT was a well-orchestrated CONSPIRACY to BENEFIT these ELITE THUGS! DOUG RIKARD-BELL BOUGH the PROPERTY for a BARGAIN NZD $38 MILLION and then SOLD it for over NZD $300 MILLION as REPORTED. The 11 INVESTORS LOST over $300 MILLION as a RESULT of this FRAUD GANG! Yes I DOCUMENTED the whole CORRUPT CASE as a EX REAL ESTATE AGENT! MY MOAI LEGAL LAND CLAIM CAVEAT was REGISTERED while the challenge of the INVESTORS dragged on I put the pressure on the TITLE as MANAWHENUA Original TAHITIAN TITLEHOLDERS! SET UP to DON GRANT was the retires LAND SURVEYOR GENERAL of NSW AUSTRALIA who was HIRED by LINZ to FORGE this 61 COOK STREET LAND TITLE in order to SELL IT and so they EMPLOYED HIM to work for LINZ Land Information New Zealand. This will affect every other LAND TITLE in New Zealand! DO NOT ARGUE as the POLICE are now INVOLVED in this case! As a Private Prosecutor now with our Private Investigator it is just a matter of working together with the Law and the Right Jurisdiction to now haul them all 12 of them in one at a time. THEY KNOW the TIME IS UP! They will learn a big lessons that IGNORANCE and FRAUD is a BAD MIXTURE in front of MOAI CROWN the POLICE SFO a dam good DETECTIVE INVESTIGATOR and GUTS! 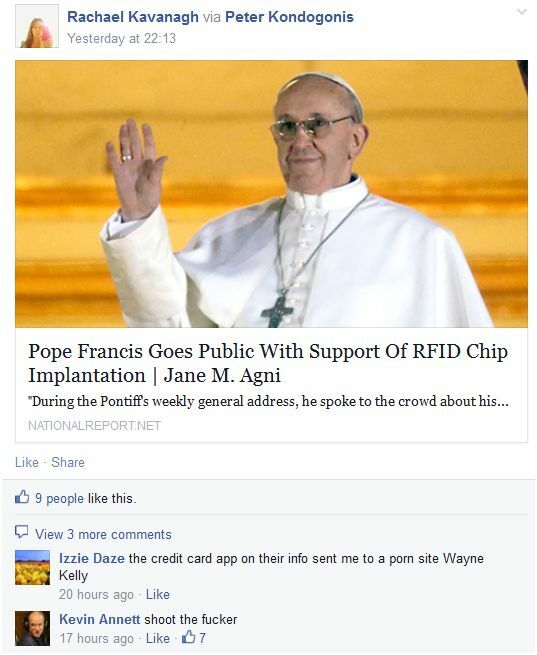 The stupid POPE GEORGE GUGLIO FRANCIS made an OFFICIAL A STATEMENT that plays right into the LEGAL HANDS of MOAI CROWN SOVEREIGN SEALED AUTHENTICATED AUTHORITY DOCUMENTS OF ULTIMATE JURISDICTION. HE SAID that if any Politician Lawyer Judge Minister Priest Bishop Citizen Alien commits any CRIME outside the VATICAN CITY and into the “SEE” of Churches around the World THEY FACE PROSECUTION! SO here we are ready! “MOAI SAYS LET THE PROSECUTIONS BEGIN!” LIGHT THE FLAME AND START BURNING ASSES! Staring with this ONE JUG HEAD! Who said “STUFF MAORI” Yes that statement STICKS after he OFFENDED NGA PUHI on the MARAE! MOAI is now officially a LEGAL FRAUD BUSTER! You don’t have to look far to find a FRAUDSTER TOO? Every politician is a FRAUDSTER behind his or her QUEEN ELIZABETH II who is now a Committed Criminal FELON by MOAI CROWN STATE the CREE TRIBE and KEVIN ANNETT ITCCS So no more GUESSING! So that is why MOAI BILL DEBT CHARGED all the accused PERSONS under the CHURCH and STATE and their ELITE ROYAL FAMILIES £1 TRILLION ‘TRILLION. Before they SCUTTLE their FRAUD in a PLANNED WAR or TRY to DESTROY the EVIDENCE and the PEOPLE in the WORLD while they HIDE in BUNKERS UNDERGROUND. Where it is REPORTED OBAMA is going to HIDE his FAMILY and all their ELITE FEDERAL STATE GOVERNMENT LEADERS! MOAI has EXPOSED their USE of KING WILLIAM GREAT SOVEREIGN SEAL OF ADMIRALTY TRADE BANK DOCUMENT OF ULTIMATE TITLE AUTHENTICITY that is MOAI CROWN STATE CONFEDERATION LEGAL PROPERTY UNREFUTED in the BRITISH HIGH COURT OF ADMIRALTY LONDON! Give ’em the ol’ Stink-eye!!! 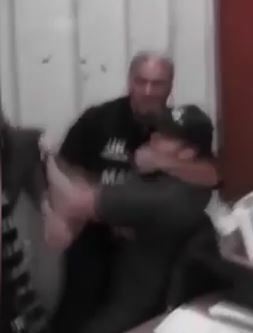 One individual had a man in a choke-hold that was reminiscent of the kind of manoevre used to break someones’ neck. Unfortunately for Wanoa, he had videotaped the entire event is now in jail until another hearing on Monday, October the 5th, 2015. 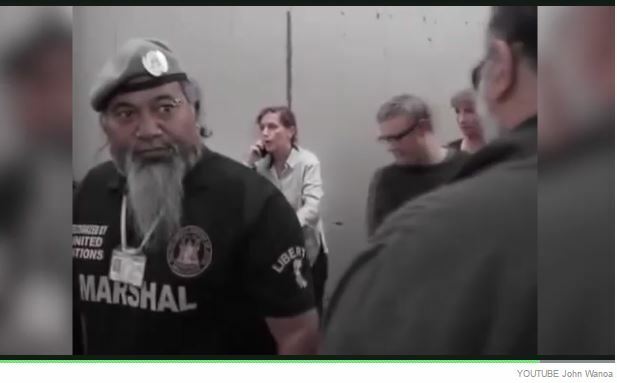 Greetings – As one of the Aotearoa Diplomatic Federal Marshals who entered the 61 Cook Street Auckland building to evict the office staff, I wish to make corrections to this page. Unfortunately the Office Staff were collateral damage. The Aotearoa Marshals are registered at the United Nations. 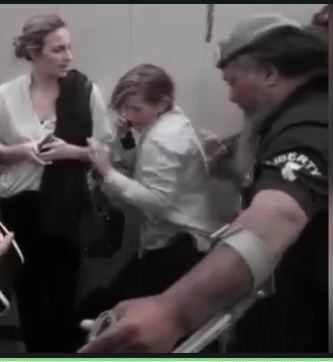 In early 2016 I laid a Huge Human Rights Complaint with the United Nations Human Rights Commissioner that saw the NZ Police withdraw all charges and dismiss each Marshal with no evidence offered. Only one person was convicted through Police deception. When the 3 Police witnesses committed blatant acts of perjury and the Police violate the Laws of New Zealand, Human Rights and United Nations Treaties, and the two Judges lacked jurisdiction to prosecute but fraudulently rode roughshod over the Rights of those charged for over 10 months, saw the Court through United Nations intervention discharge us without conviction. Other fallout that ensued, was John Key’s resignation as Prime Minister, Helen Clarke vetoed from her U.N position and Murray McCully’s resignation from the U.N. NZ’s U.N. representatives were sent packing. 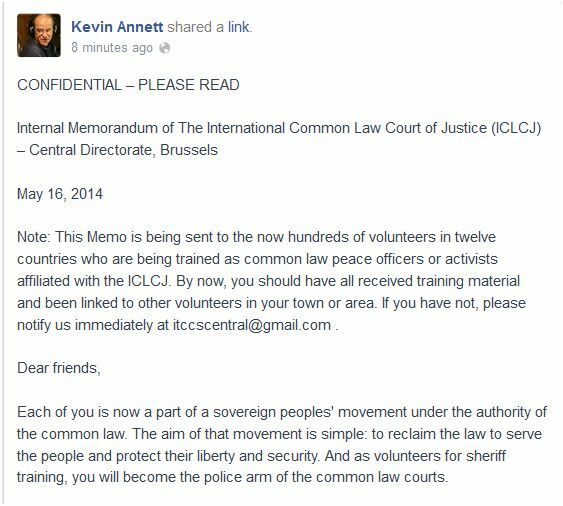 I state the Marshals have absolutely no connection with the ITCCS or Kevin Annett, the Heading ITCCS affiliated NZ Marshals is false. John Wanoa is a separate entity and is not and has not been a part of the Marshals.